If you're in the market for a premium sedan whose road manners are as smart as its styling and price, the A6 should be on your list. Those who live in foul-weather regions will appreciate the impressive abilities afforded by the A6's quattro all-wheel drive. 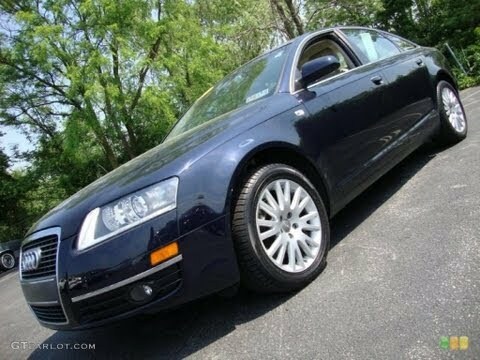 The 2007 Audi a6 (the a stands for awesome). My car is an 2007 Audi a6 quattro. It gets about 21 city miles to the gallon and between 24 and 25 highway miles to the gallon. I love the way my car drives and handles in the snow- living in Wisconsin winters makes that a very important thing! It also is a very heavy car, mine is about 5000 lbs. It gets up to speed fast and it does not feel like you are going very fast. Audi fun! See for yourself! Handles awesome with fun interior. Neat to look at. Decent gas mileage, but could probably be improved upon. Extras in car are a real plus to the driving experience. Headlights are special in the bright white and provide ample sight for night driving purposes. Go for the option of a sun roof. . , You will not be disappointed. My Audi A6 is German, and rather luxurious despite its age. My whole life, I have liked German cars and this particular model is especially one of my favorites. It is large enough to fit 4 people comfortably, and gets decent gas mileage with great handling. Its expensive to maintain, however It has had a good life and fulfills my desires for a vehicle for the time being.